Professional Oven Cleaning in Hounslow. Did you know that a clean oven cooks much faster and much tastier and healthier food? Yes, it is true. This is why you should contact Thomsons Cleaning expert company. 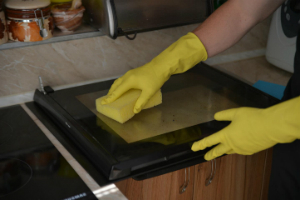 We provide professional oven cleaning in Hounslow TW and can deep clean just about any kitchen appliance for our private and commercial clients. A deep cleaned oven will last you longer, use less energy and will cook much healthier and tastier food. We use only completely safe, Prochem certified cleaning solutions, which means that the oven can safely be used immediately after we are done with the cleaning. To get an absolutely free price offer for this service call our 24 hour customer support operators at 020 3746 0000 or online here. Thomsons Cleaning Hounslow TW experts can clean all kinds of ovens, including: range ovens, hotplates, cook tops, double ovens, microwaves and barbecues. We can also deep clean your freezer, dish washing machine, refrigerator, warming drawers, extractors, washing machine, hobs and more. Even more, we can perform a deep kitchen cleaning for you and scrub your tiles and grout, splash backs, duct work and others. So if you want to prolong the life of your oven, make your food tastier and healthier, and save energy, book our oven cleaning service right away. Thomsons Cleaning Hounslow TW use the dip tank oven cleaning method which is highly efficient and yet perfectly safe. The cleaner or team of cleaners arrive at your address and perform a test of the oven functionality. If it works alright, they will proceed to disassemble it carefully. All removable parts, such as racks, knobs, light protectors, trays and other are removed and dipped into a tank with a special solution and left to soak. The oven itself is scrubbed to perfection from the outside and inside with other oven cleaning solutions and with the help of wired brushes and other tools. Any burnt on carbon, grime and food is scrubbed off. Then the soaked parts are also scrubbed thoroughly. After everything is rinsed and dried, the cleaners will test your oven again in front of you. Our cleaners can use this cleaning technique to clean just about any kitchen appliance. The commercial and domestic kitchen owners in Hounslow TW have selected us as a top preferred oven cleaning company in the area. The reason is that all of our cleaners are friendly, reliable, trained and experienced. Plus, our services are fully insured and we use only the leading and latest approved and safe cleaning methods, equipment and solutions. All of our cleaning technicians are trained and are vetted to work in accordance to our approved safety and quality work methods, and pre-approved cleaning checklists. The cleaning solutions are eco-friendly and absolutely safe, so there is no danger from any harmful fumes affecting the food being cooked or the people cooking it. Our cleaners can deep clean just about any kitchen appliance. Call our non-stop customer care operators in order to book our expert oven cleaning service in Hounslow TW. If you need we can do an emergency same day cleaning for you. Otherwise, you get to choose from flexible hours and any day of the year. If you book multiple of our services, we will give you a serious discount from the prices. Just call 020 3746 0000. Our booking doesn’t require a deposit. Regular customers get preferential offers. Otherwise our prices are fixed, and there are no hidden fees. We accept flexible payment methods for your convenience. Book now!